Poor ol' Nidulus. He's such a misfit that even Trametes got sick of him, and he had to set up his own, one-species genus. Yes, those photos all represent the same, very odd mushroom. 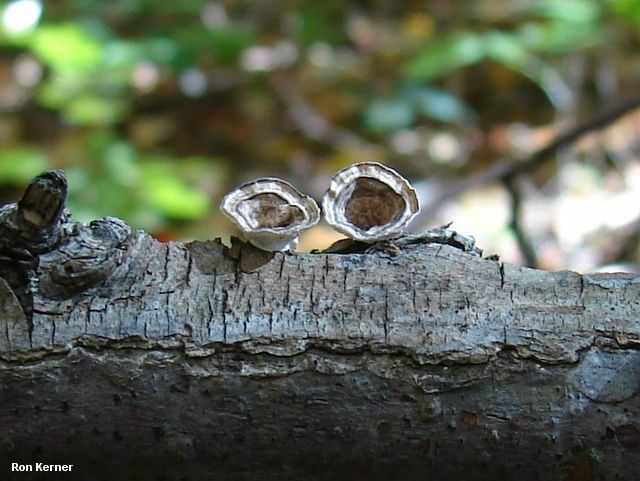 Poronidulus conchifer (often called Trametes conchifer in field guides) starts out as a tiny, bowl-like thing that looks for all the world like a cup fungus or a bird's nest fungus without its eggs. 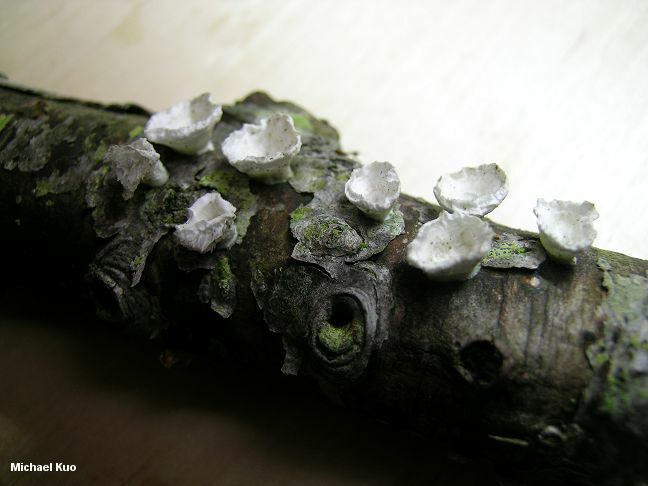 Later, a polypore develops as an extension of the cup, often engulfing it with a pore surface or flesh. At maturity the cup can sometimes be detected as a swallowed-looking lump or disc at the base of the cap, or as a pore-covered lumpy structure that looks like a lateral stem. Bird's nest fungus expert H. J. Brodie was not really a "polypore man," but he obviously couldn't let it go when a polypore looked like a bird's nest fungus; publishing in Science (1951) he determined that the cup-like stage of Poronidulus conchifer served as a splash-cup apparatus for the distribution of asexual spores. Thus the mushroom extended its reproductive period, and hedged its bets by cloning itself before engaging in sexual reproduction and producing sexual spores like a "normal" polypore. 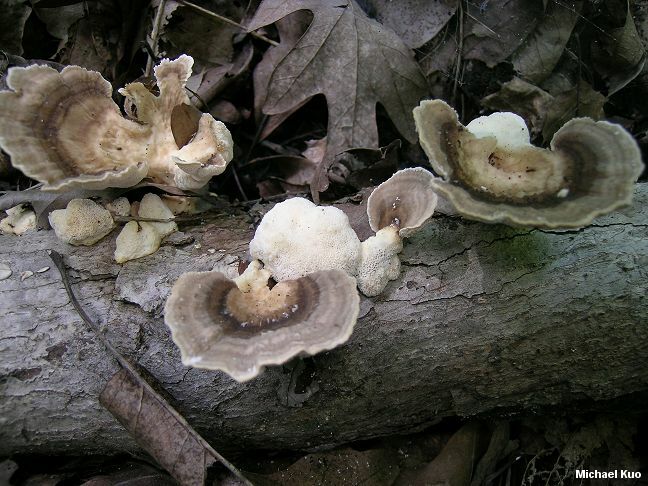 Trametes conchifer and Polyporus conchifer are synonyms. Ecology: Saprobic on the deadwood of hardwoods (primarily elms); annual; causing a white rot; growing in clusters on branches, logs and stumps; spring through fall; widely distributed from the Great Plains eastward. Fruiting Body: At first cup-like; developing a cap as an extension of the cup. Cups: Saucer- to cup-shaped; to about 15 mm wide; upper surface white to brown, usually with zones of color, smooth; undersurface white; with a tiny stem-like structure. 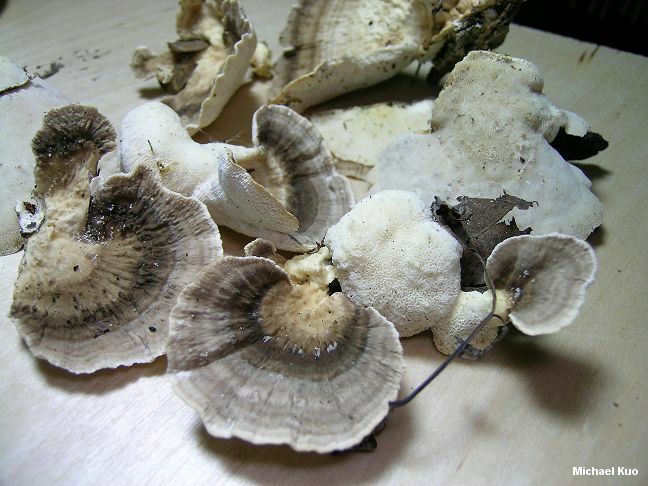 Cap: Up to 5 cm across and 3 cm deep; semicircular, irregularly bracket-shaped, or kidney-shaped; occasionally fusing laterally with other caps; bald; radially furrowed and wrinkled; whitish to pale brownish; with concentric zones of color. Pore Surface: Whitish, becoming a little yellowish with age; with 2-4 circular to angular pores per mm; tubes to 2 mm deep. Chemical Reactions: KOH on flesh negative to yellowish. Microscopic Features: Spores 5-7 x 1.5-2 µ; smooth; cylindric; inamyloid. Cystidia absent. Hyphal system trimitic. Asexual spores produced by cups rod-shaped; 3-8 x 3 µ.
REFERENCES: (Schweinitz, 1822) Murrill, 1904. (Fries, 1828; Saccardo, 1888; Brodie, 1951; Overholts, 1953; Gilbertson & Ryvarden, 1987; Phillips, 1991/2005; Lincoff, 1992; Horn, Kay & Abel, 1993; Barron, 1999; McNeil, 2006.) Herb. Kuo 04190901, 07210804.